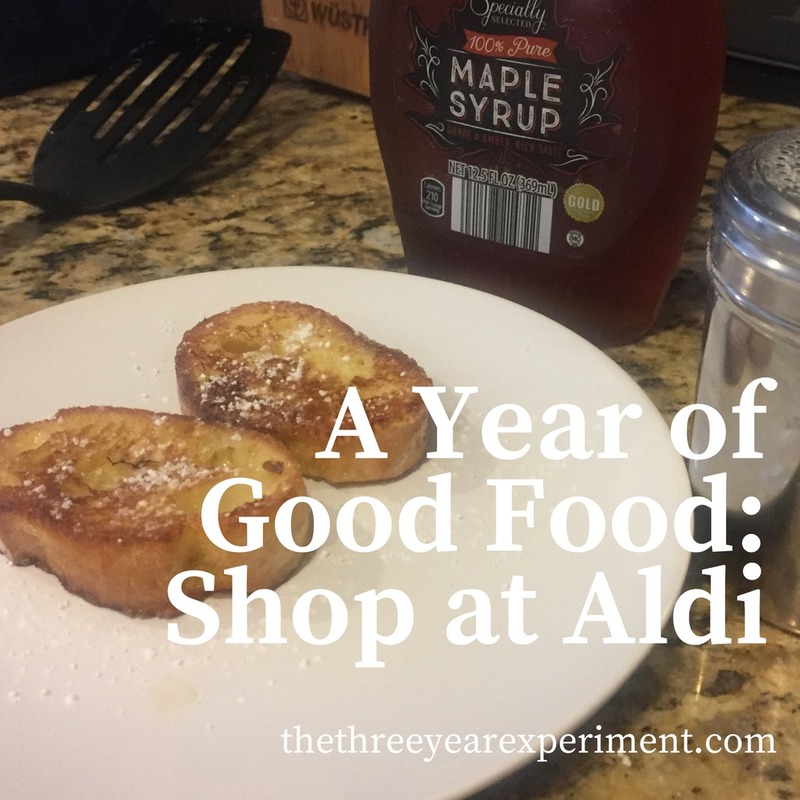 Time for the seventh installment of our family’s grocery challenge for the year, which I’m calling “A Year of Good Food.” (Spoiler: this is the first month we failed). At the beginning of July, we moved from New Hampshire to North Carolina. We sold a house there and bought a house here, but along the way, we lived in hotels and stayed with my sister for about a week, then filled up a new fridge and pantry, then fed all four of us breakfast, lunch, and dinner all month. We blew an exorbitant sum of money on everything in July, including food. Each month, we’re trying out a new way to save money at the grocery store. Last month, we focused on staying in budget while moving houses. We kept our expectations low–I knew I wouldn’t be able to consistently meal plan or regularly grocery shop, so the idea was to do as well as we could despite the chaos. Ok, I’m going to get real with you this morning. This privileged WASPy white woman who currently doesn’t work (much) and who really only has to make sure that she keeps her two kids alive and make them clean the bathrooms for her has another first world problem. We got a puppy. And I have to watch it all the time. Because of course it lives inside and has the Prince(ss) of Bel Air life right now, complete with training treats and grooming gloves. She gets up at 5am which is normally my prime writing time, so this post may or may not make sense, because I have to check to make sure she’s not tee-teeing under the bed every 2 minutes. We did not get the puppy in July, though, so I digress something mighty. Lack of sleep will do that to you. 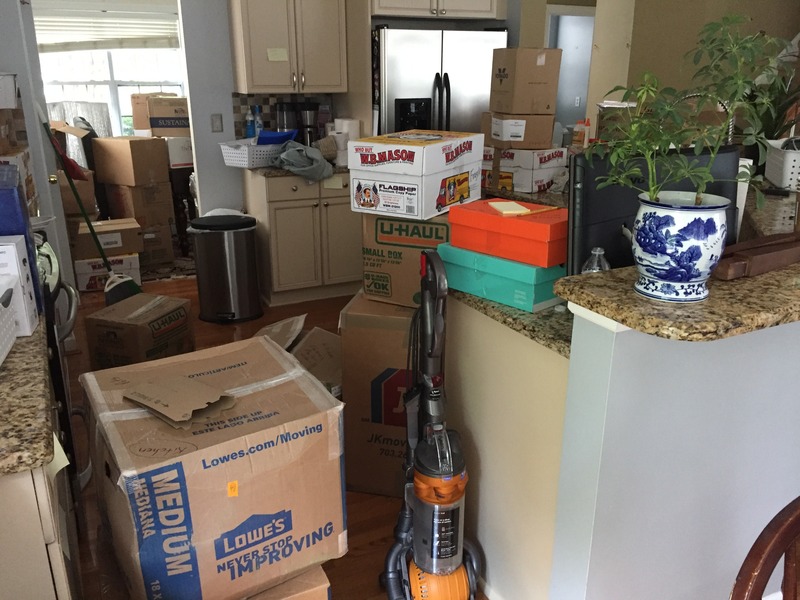 We spent the majority of the month unpacking boxes and getting acclimated to our new house. Mr. ThreeYear started working from home, which is both weird and wonderful, as he’s… home all the time! He eats every meal at home, so during July, all four of us ate every meal at home, except for the week we spent at the beach, when we ate every meal at the beach. It took awhile to unpack all these. I didn’t even notice we were going over budget, probably because I was busy spending money in every other budgeting category. We were also getting used to the heat, and drinking beverages like crazy. We have a Soda Stream and love it, but the $2.50/12 pack of seltzers kept ending up in our cart. I also think that mental fatigue played a part. We had been “on” for our move since about March, getting the house ready, selling it, packing up our stuff, buying a house in NC, and once we moved and got a reasonable amount of boxes unpack, we could finally relax and rest. Moving in was about ten times as hard as I predicted and expected, and I’m glad that pretty much on the other side now. Filling up an empty refrigerator and pantry is easy to do. It was so incredibly easy to blow through all that cash last month without even realizing (otherwise, I would have tried to stop the bleeding!). These shopping trips happened the first few days we arrived in North Carolina, and involved filling up our refrigerator and pantry and buying new condiments. I was SOOO excited for my first shopping trip to Aldi. We inevitably needed a few more things to fill the fridge, probably seltzers and ice cream. This week we went to the beach with my family, and arrived after everyone was already there, so of course there was a ton of food. 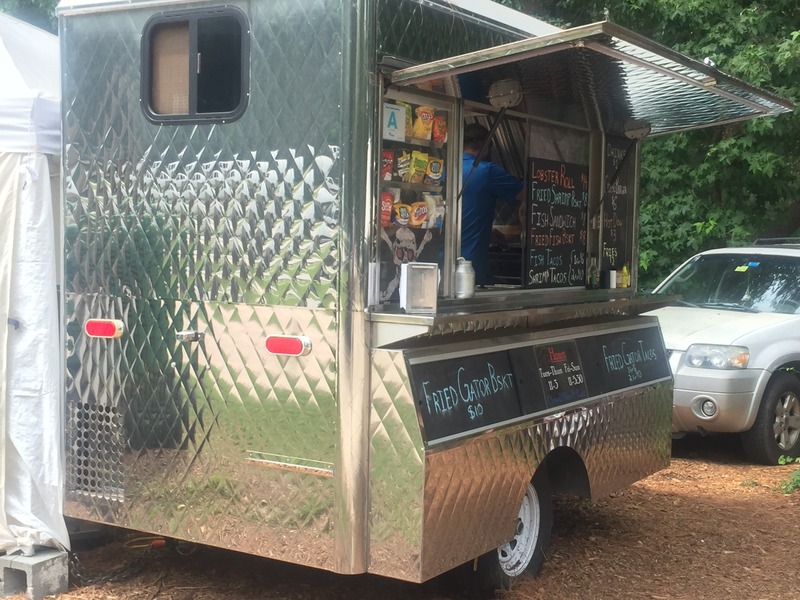 A food truck we visited at the beach, replete with fried gator. It felt like we had no food in the house when we got back from the beach, aside from ketchup and Duke’s mayonnaise, a staple in any self-respecting Southern woman’s fridge. We actually didn’t have much. 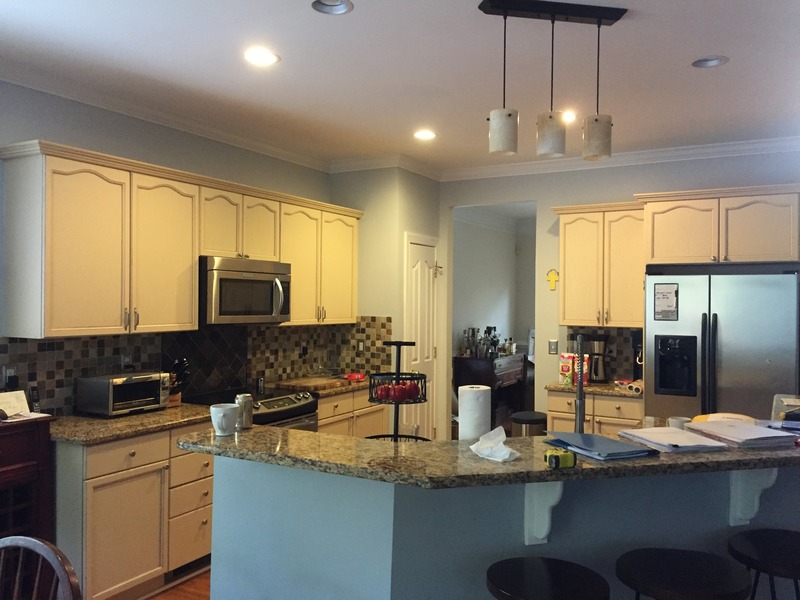 Our new, somewhat messy, kitchen. Mr. ThreeYear and the kids came with me on this trip to Aldi and we bought all. the. food. We bought a lot of canned items and other pantry staples so that we really did stock up the pantry on this trip. The side trips really did kill us this month, per usual. I will continue to believe that we can cut them out!! I feel like July pressed me through a pulp machine and squeezed me flat. I’m really glad I don’t have to relive that month again. It felt like it was about three or four months long, because everything was a new experience and so strange and new. I learned that Aldi is a great place to shop BUT like everywhere I need to go in with a list and meal plan beforehand. The same lessons, over and over. 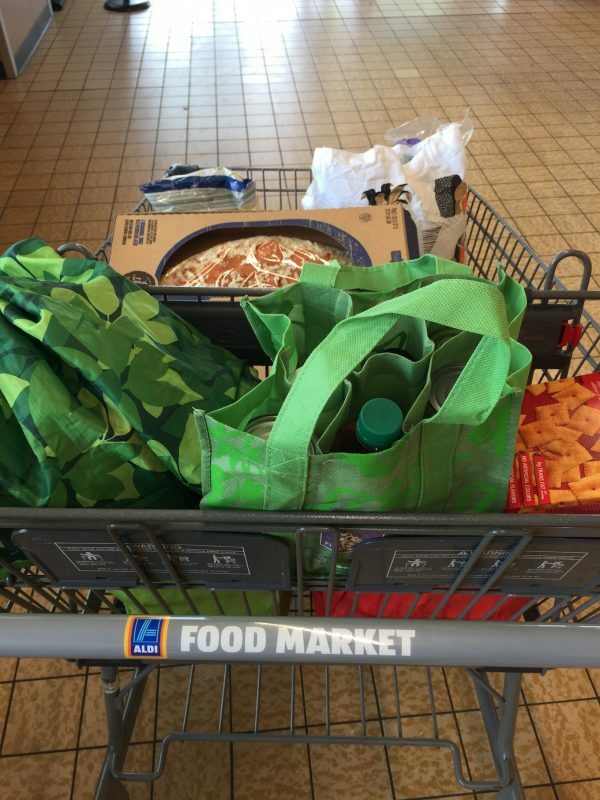 This month I am going to focus on doing my weekly shopping at Aldi and avoiding good-ole’ Harris Teeter, unless it’s part of my main weekly shopping (they have good loss leaders). We continue to eat the simplest of dinners, which we have on repeat–tacos, spaghetti, grilled chicken, stir fried veggies, hot dogs. The kids are in heaven though. I’m obviously going to also work really hard to stay in budget this month so that we can chalk July up to a moving anomaly. I’m still one month ahead in YNAB which I’ll write about soon. That means I am being super strict about staying in budget so we can continue to use this month’s income to fund next month. It’s a powerful feeling to be a month ahead, even when you have a large emergency fund. Stay chill in August! Thanks for reading! Aldi’s the best! Not only is pretty much everything cheaper and just as good, it’s a smaller store, so it takes less time to go through it! That is a really good point! I don’t seem to get so overwhelmed by choice there! i’m so glad you’re giving duke’s mayo all the glory it deserves. have you made pimento cheese yet? if i lived in the south i would have a heart attack just from spreading that stuff on everything. 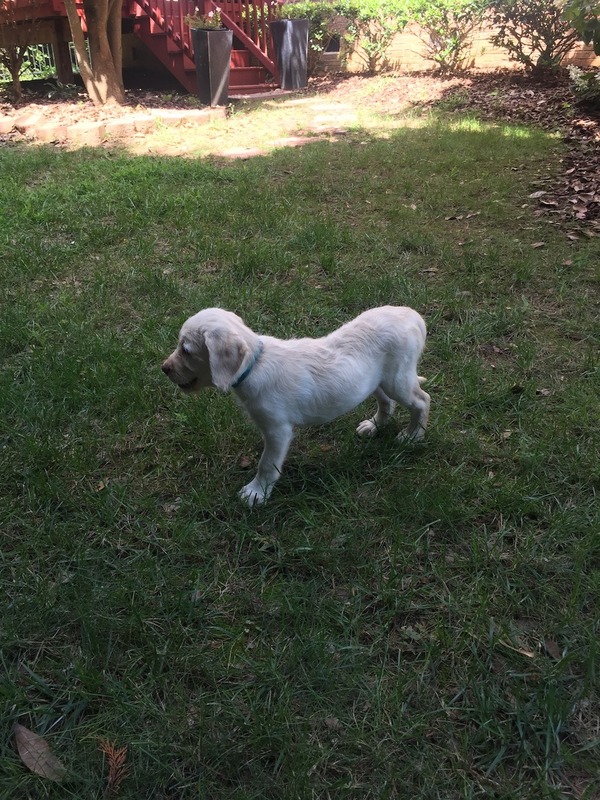 and forget all that anyhow….you got a puppy!!! that’s just great. i hope you crate train her. let me know if you need any help along the way in the training. good luck with little lucy. Ahhh, pimento cheese. A little taste of heaven. Haven’t had any yet, which is probably a good thing because it’s addictive! Ok YES please help with puppy training! We are crate training (and it’s going really well) but I’m having trouble leash training her. Any tips??? I am not a very knowledgeable dog person! yes, i have some tips. you need a training collar and don’t start with a harness. with a puppy it should be easier to teach them to heel. you can use a slip lead or but get decent equipment. if i didn’t know much about dogs i would enroll at something like petsmart classes which are pretty inexpensive usually or find a group class for cheap that meets outdoors. you could always watch some into videos on starting leash training on youtube. i’ll be following your progress. step one is just put the training collar on and start walking he/she will follow . it will be lots of stopping and starting at first. they are really learning that if the training collar is making them uncomfortable they can release the pressure by taking pressure off the leash. be patient and good luck! it’s all psychology for the animal. Ok these are great. I YouTubed a bunch and have got her doing much better. We went on a walk this morning and she did really well. I use a collar not a harness and it’s worked well. I have to be really patient and go on really short walks, but I think it’s starting to pay off. I also leashed her in the house for an entire day and walked around with her and made her stop and sit for training treats. That worked really well. I haven’t found a class yet but she hasn’t gotten her second round of shots yet so I think I’m going to wait until then. We have a Petsmart really close. Next Next post: Is All Our Goal Setting Messing with Our Happiness?